William John Tytherleigh, always known as “Johnny”, was born in Cambridge on 8 November 1921. He joined the RAF in 1940, and qualified as an observer/air gunner the following spring. He was posted to 50 Squadron in the crew of Sgt Douglas Atkinson (who was also known by the nickname of Johnny). This crew completed a full tour in Hampdens between November 1941 and June 1942. Tytherleigh was commissioned in April 1942. At the end of their tour, he gave his pilot Atkinson an engraved gold propelling pencil, along with a handwritten message ‘To help say thank you Douglas for seeing me through – Johnny’. This was found by Atkinson’s son after the war. After a spell in a training unit Tytherleigh rejoined 50 Squadron in the autumn of 1942. By then, they were flying Lancasters, and Tytherleigh was stationed in the mid upper turret. 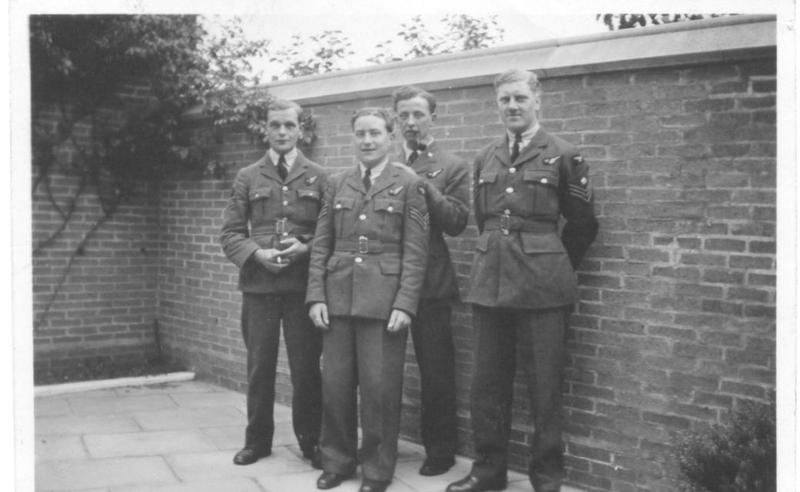 On 2 February 1943, he joined up with Henry Maudslay, Robert Urquhart and Norman Burrows for the first time, on an operation to Cologne, and he flew a further eight times with this crew, until they were all transferred to 617 Squadron. On the Dams Raid, he was occupying the front gun turret of AJ-Z, which would have meant he was very close to the explosion when its Upkeep mine went off as it hit the parapet of the Eder Dam. As their damaged aircraft stuttered homewards, it flew too close to a flak battery on the outskirts of Emmerich, and they were shot down. When they got to the crash site, the Germans could not identify the individual remains of William Tytherleigh, Michael Fuller and Robert Urquhart, and they were buried together in a single grave. After the war, they were all reinterred in Reichswald Forest war cemetery. Like Urquhart, Tytherleigh had been recommended for a DFC at the time of his transfer from 50 Squadron. He had completed 42 operations. However, just as happened with his colleague, the recommendation got ‘lost’ for over two years, and it was not announced until June 1945.. Articles in Brighton Argus and Daily Telegraph from 2000, about a failed attempt to auction a fake letter to the Tytherleigh family.